• Don't be fooled by other probiotics’ CFU count, more is not always better. 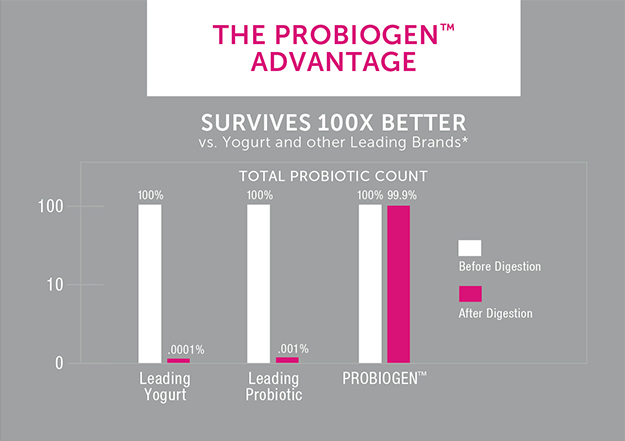 Our 8 Billion Thriving Spore CFUs is EQUIVALENT to 100+ Billion CFUS in Today's Leading Probiotics, and the difference is Probiogen's Probiotics arrive alive! • Experience the Probiogen Advantage! Daily Digestive Balance provides the highest potency spore + yeast probiotic on the market for superior Digestive + Immune System Health. DAILY DIGESTIVE BALANCE by Probiogen™ is the highest potency spore and yeast (dairy-free) acid stable probiotic available on the market today. Our microbiologist-formulated products are guaranteed to survive and thrive in the gut 100x better than leading brands available today. Poor diet, pollutants, and antibiotics can all wreak havoc in our gut. Probiotics provide the good bacteria that regulate your inner ecosystem to promote health from the inside out. DAILY DIGESTIVE BALANCE supports healthy digestion, immune system health, and vitality. Feel the Probiogen™ difference! S. boulardii: Yeast probiotic typically used for upset stomach and general digestive disorders. Bacillus coagulans HC™: A spore-forming probiotic, studied and supported by clinical research. Helpful in reducing gas, bloating, and digestive discomfort. Bacillus clausii: A well-studied, spore-forming probiotic with high efficacy and excellent tolerability. B. clausii can colonize in the intestine in the presence of antibiotics. Helps support healthy allergic and inflammatory responses. Suggested Use: Take one (1) capsule daily after a meal or as directed by your physician. No refrigeration needed. Warning: If you are pregnant or lactating, consult a healthcare professional before using this product. Store in a cool, dry place. Do not use this product if the safety seal on the bottle is broken. Keep out of reach of children. I have been using practitioner only probiotics for years for gut issues. I had a noticeable difference within 3 days of starting my first bottle of Probiogen and will keep using this as part of my wellness protocol. I have been using probiogen balance for 3 weeks now, and it is working like a miracle for my gut problems.At last something that works!! I have been taking Probiogen Balance for about 4 weeks now and they have been really good - especially since I have just finished a course of antibiotics which usually make me feel grotty, but this time they were a breeze and the only thing different is the Probiogen balance. Love this probiotic that my doctor recommended for me. Will buy again. This is an excellent product. Has worked wonders with my digestive system. It's more that I notice when I've run out or forgotten to take it. and the gas and bloating returns; then I really appreciate how well they work. 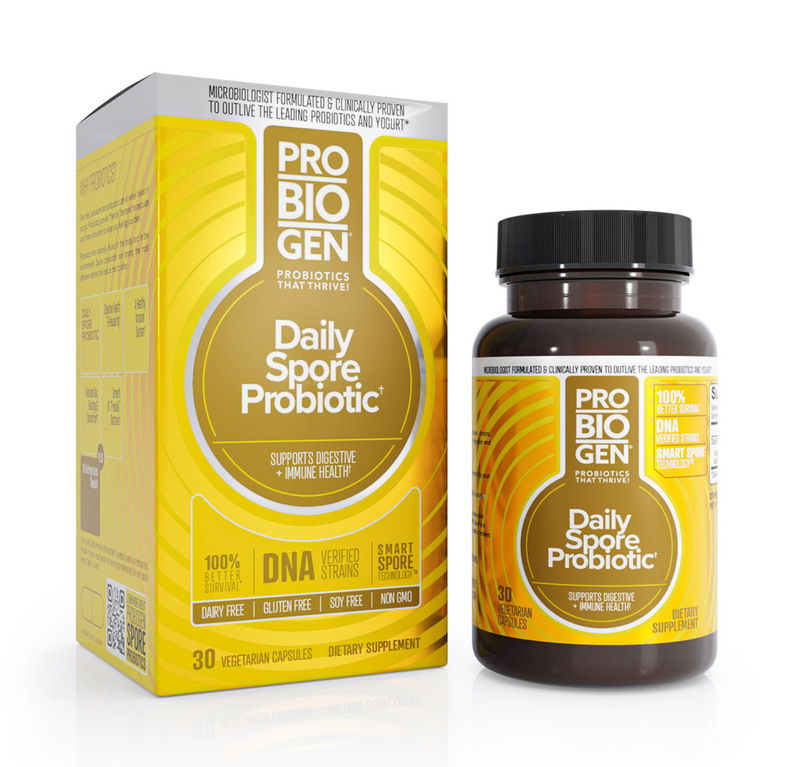 I've tried dozens of different probiotic supplements and never noticed any difference until I tried Probiogen Daily Digestive Balance. They have sorted out my digestive issues and I am now on my third bottle. When they have run out in between packs my IBS-D has returned, but as long as I am taking these it's completely under control. Great probiotic. Research the strains contained in this probiotic and you will find a lot of research supporting their effectiveness. I think spore forming probiotics are the way of the future. Biovea has the best price for these that I have found as well. Have used these for a few months and have helped with gut issues. It's hard to accurately rate this product on a "like" or "don't like" scale because it depends on how effectively it stregthens my immune system, along with diet and a cocktail of other herbal meds I've been prescribed by my anti-cancer alternative therapy clinic in the long term. Measuring the strength of my immune system isn't something I can easily do by myself; it will need analysis of blood test and CT scan results over many months. All I can do is to keep asking my clinic doctor how much longer I need to continue with diet and Probiogen and the other meds. Up to now I haven't managed to get a clear answer from the doctor so all I know is that Probiogen continues to be recommended for me by a professional. I have been using these for about 3 months now and my gut problems have much improved. I have been taking them along with collagen and l-glutamine for leak gut and have so much more energy now.